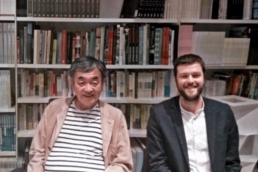 I interviewed well known Japanese architect Kengo Kuma on the occasion of his installation at the Biennale collateral event “Across Chinese Cities”, during the 15. 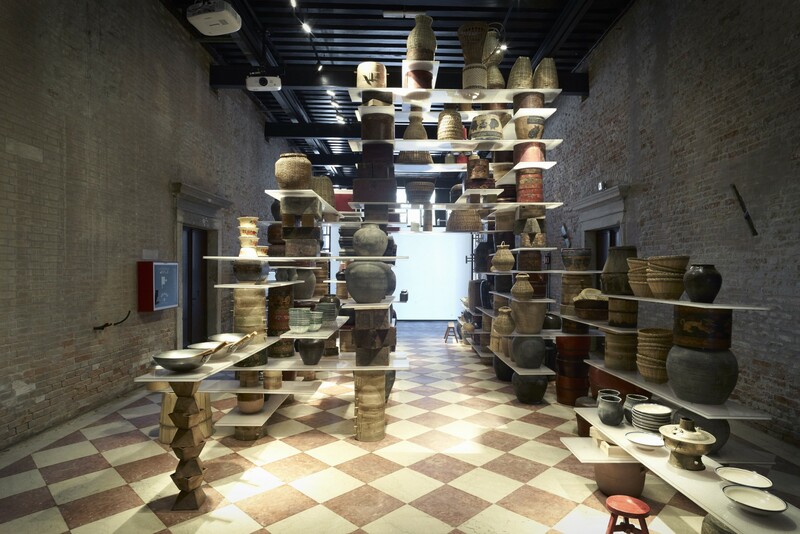 Architecture Biennale of Venice. 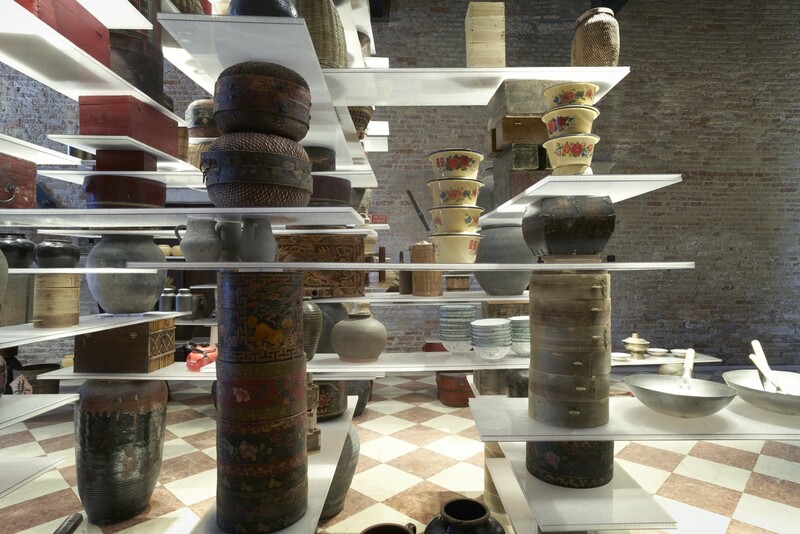 “Chengdu Kitchen Project” is one of the exhibition’s “chapters”, initiated and curated by Weng Ling of the Beijing Center for the Arts and specifically dedicated to the Chinese prefecture of Chengdu. Kengo Kuma was called, together with Winy Maas and media artist Au Yeung Ying Chai, to reflect upon the kitchen as a place for exploring the changes in our daily lives and envisioning the future of the home environment. 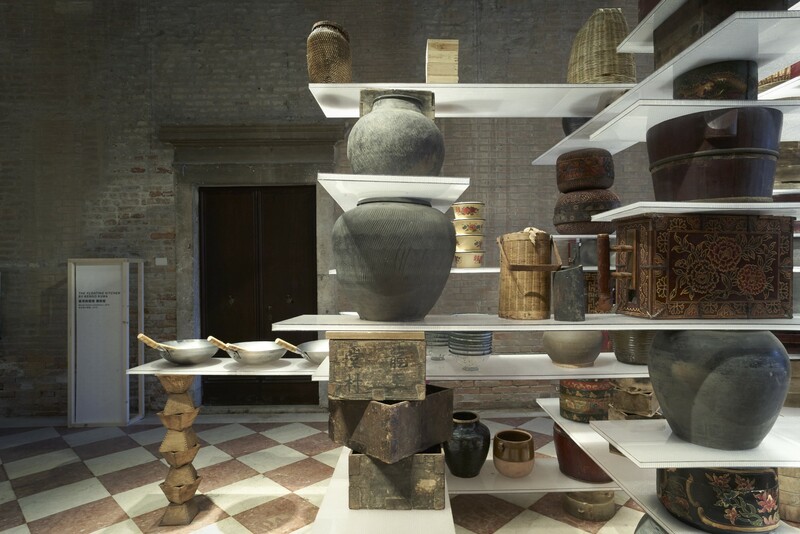 He answered with a very inspiring installation, which he entitled “The Floating Kitchen”. 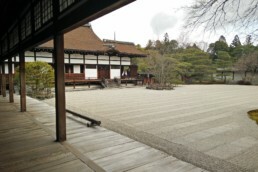 Discovering the local culture, meeting the people and looking for traditional materials and techniques have been the bases of the project. 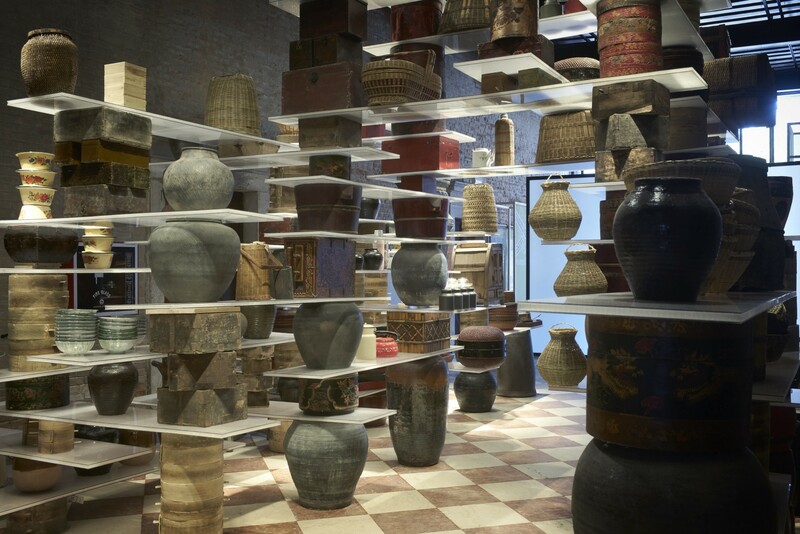 The result is a site-specific installation, built on the collection and accumulation of vernacular objects related to Chinese social practices and cooking environments. As a Japanese architect, you have been visiting and practicing in China for a long time, how does this country influence your work? My first project in China was the Bamboo House: it was about 15 years ago. It was not an easy project, because many things in China, such as the construction quality and materials, are very different from Japan. A big difference is that in Japan everybody tries to control everything, but in China people do not want to control everything, to the point that uncontrolled materials are arriving at the construction sites. At the beginning, working on my first project, I was very disappointed to see this kind of “no-control”, but time by time again I began to understand it as a kind of generosity, one which is actually at the base of Chinese culture. Japan is a small country and people live there as you would in a small village, very structured and organised, but China is a combination of very different people, cultures and lifestyles: diversity is at the base of Chinese culture. For the installation in Venice, I wanted to show this kind of diversity of cultures and its dynamics within one single country. For achieving this purpose, I tried to aggregate many different daily items, to show the cultural strength of daily life in China. You are accumulating different traditional objects in order to show the richness of their diversity. I know your projects have been tackling the issue of linking tradition and innovation for a long time. 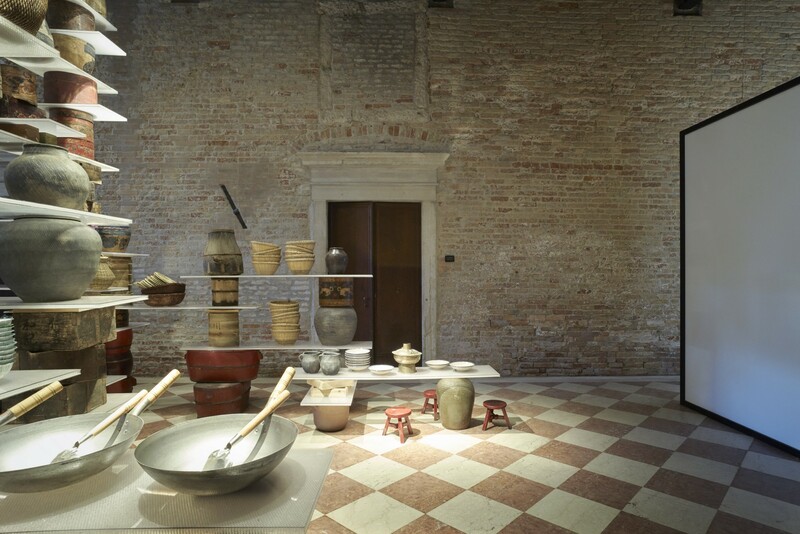 The exhibition brief was about using the kitchen as a symbolic theme for reflecting about the future of the living environment: how do you perceive the presence of tradition in this sense? About tradition, I would like to say that, traditionally, the kitchen is a very exciting space, because we can see it as a collection of food, of tools… and all the kind of things which used to be the protagonists of the kitchen. In the 20th century cleanness became the goal of kitchen design. In the industrial era people liked to create very standard, systematic, monolithic spaces, somehow hiding the exciting aspects of the traditional kitchen. I think this is a real pity for our lives, because living things should always have the central role: during the 20th century, we killed those kinds of lives. With “The Floating Kitchen” I wanted to show those exciting elements and give the impression of a kitchen which is very different from the 20th century one. You designed this installation through a very poetic approach, different from the usual way of exhibiting architecture. Which way do you think is most effective for exhibiting architecture? What did you want to conceive with this kind of artistic installation, what did you want to express to the public? “The Floating Kitchen” is a kind of message to the public that can be adapted to, but also overcomes architectural design: it is not a proposal for a new kitchen, it is a proposal for a new approach to design. 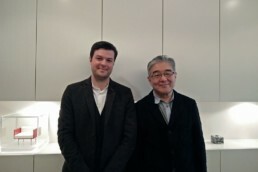 My message is: in architectural design, the living elements should always be the protagonists. In the 20th century, architects wanted to become the only protagonists, they wanted to control everything and tried to kill every living element in their design: it was a big mistake of 20th century architecture and I want to find a different way of expressing architecture. As in many previous works of yours, you seem to be dissolving architecture into a very light and permeable structure. 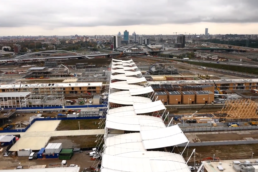 Does this have a connection with your understanding of architectural design in relation to what is nowadays referred to as “the noisiness” of cities? I mean, in your opinion, is the presence of people and objects overcoming the framework of architecture? Yes, I want to dissolve the architectural shape and frame. I like to activate people’s and objects’ daily lives. This is a kind of a new trend, but in the future I think architecture will dissolve and the relationships between people and objects will be viewed as architecture. So, you are saying that the architect is going to design possible situations rather than finite structures. This seems to be contrasting with the installation by Winy Maas, which looks as a rather definite and sharp solution. On the contrary, your installation is open to several interpretations. An aspect that I think might be in common between the two installations is the search for transparency: where you are dealing with transparency in a more conceptual and cultural way, thanks to a permeable and changeable arrangement of objects; he is achieving transparency differently, through the transparent material the kitchen is made of. Do you see any similarities between the two installations or do you only see contrasts? 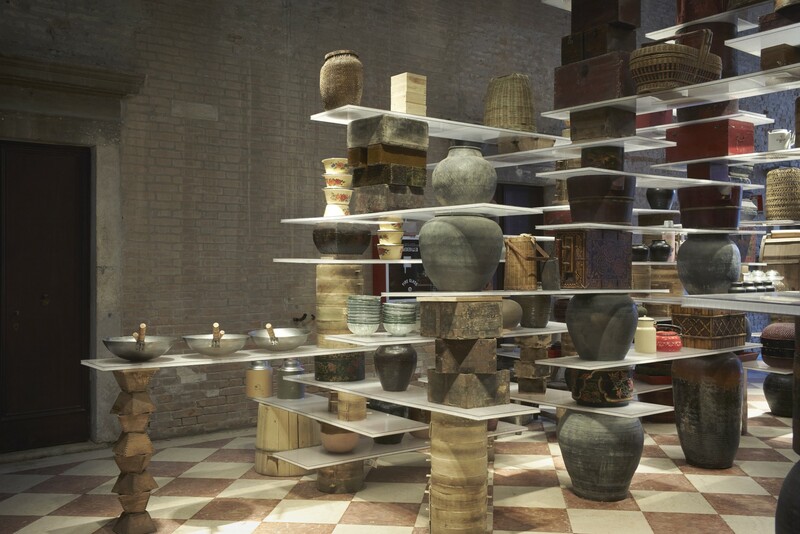 Winy Maas’ “Infinity Kitchen” is beautiful: I feel like he is trying to control everything in a very transparent way, but still, in his kitchen, the standard frame and setting remain. My kitchen is going towards a different direction, trying to destroy the frame, the structure, just as in my architecture I try to destroy structure and regularity. There is a big difference between his work and my work. I was curious about the topic of the kitchen as a starting point for researching and inspiring new modalities of conviviality and of social and spatial forms in both the private and the public realms. What are your thoughts on the relation between food and space design? The kitchen as a starting point: for you, is food important in design? I think that food is the prime and main thing of our daily lives. People are talking a lot about how to relate to nature and the environment: actually, I think that this happens in the space of the kitchen. The kitchen is the real interface between nature and our lives. Therefore, this is the most important space in the house. People misunderstand the living space as the most important, but I do not think so: I think the kitchen is the most important one, because it is where we can define the relationship between nature and humans. Especially for Chinese people, food is very important: Chinese people understand the value of food in life. I respect their kind of lifestyle and with my installation I want to show my respect for this culture. 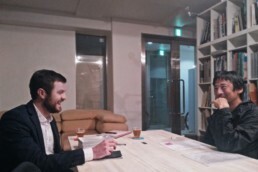 As a Japanese architect working in China, you are trying to express your respect for the long history of China, which is actually at the origin of the Japanese culture. So, to conclude, may you say a word about the Chinese region of Chengdu? On the occasion of this installation, you have been researching and personally collecting objects there: could you tell us what you found was particularly interesting from that region, was there something that impressed you? Chengdu is one of my favorite places in China because the nature and the city are very integrated: the river and the mountains are very close to the urban area, so the vegetation is very luxuriant; it makes for a very active interface between nature and humans. Lastly, Chengdu’s food is still very specific to the region: strong, spicy and tasty. I like this food and I like the landscape of Chengdu, with my installation I want to pay an homage to the culture of Chengdu. Differently from Winy Maas and his “Infinity Kitchen”, where he expresses a definite and global answer to actual needs and mindsets through the design of a very unique kitchen solution, Kengo Kuma tries to give a clue to the audience about his architectural thought in a poetic way, designing an installation very specific to the region of Chengdu, giving importance to local people and customs, and letting the public feel the spirit of the place thanks to the accumulation of the collected items. The aim is to express the essence of space as it is felt in China, where the ambience of the people meeting overlays any structure. People and their objects are the core of Chinese space: architecture is only the framework, not its spirit.